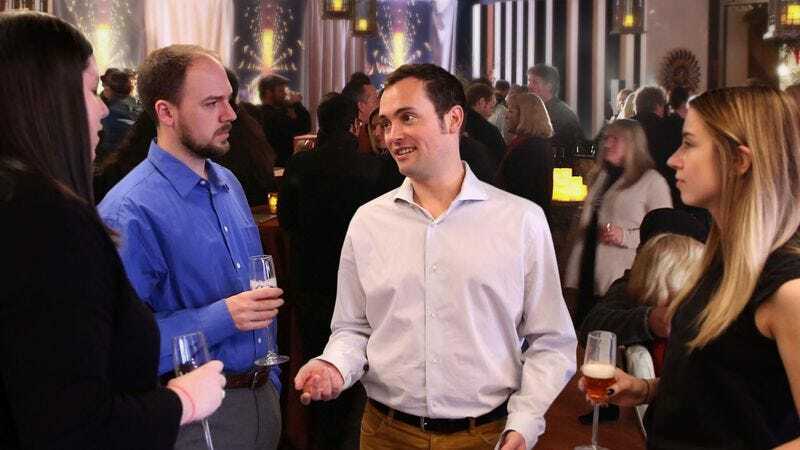 SEATTLE—Despite not consuming a single alcoholic beverage throughout the entire event, local marketing associate Patrick Liepert is somehow managing to make a complete fool of himself at Precision Intermedia’s end-of-quarter party Friday, fellow employees confirmed. “Just look at him—he hasn’t even touched the open bar, and yet he’s still knocked over a plate of buffalo wings and made at least two clumsy passes at interns,” Liepert’s coworker Katie Rankin said as the completely sober man, failing to pick up on social cues that a nearby conversation was over, launched into a meandering anecdote about his former college roommate. “It’s actually kind of impressive. Embarrassing yourself as badly as Patrick normally takes at least a few strong drinks on an empty stomach. But he’s gone completely sloppy from a seltzer water.” At press time, Liepert, whose last alcoholic beverage was reportedly more than a week ago, was telling his boss in too loud a voice how he would have handled the client presentation earlier that day.